In May, both the adult and nymph black-legged ticks are active. “It’s important that we realize that the time of year when the risk of tick-borne disease is the greatest is right now, when the nymphs are active -- that’s because they’re so small they’re hard to see,” Eaton says. Nymphs begin emerging mid-May and are especially hard to see. 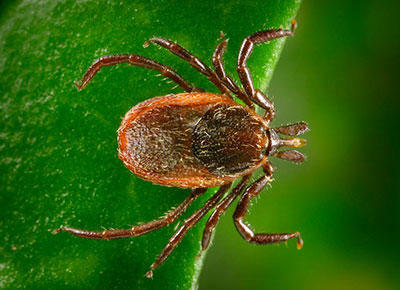 When will the Lyme PRep treatment be on the market? “We have made a lot of progress over the past year … we are talking to a number of larger pharmaceutical companies that we would need to partner with, in order to move it into the clinic,” says Klempner. The plentiful food allows the mice to “get a jump-start on their reproductive season, and so by the following summer the white-footed mice have reached a population peak," says Ostfeld. Some hosts are good at grooming – for example, opossums kill about 95% of the larval-stage ticks that try to bite them. “We’ve estimated an individual opossum can kill up to several thousand larval ticks per week during the peak of the larval stage,” says Ostfeld. Ostfeld blames forest fragmentation for the loss of habitat for other animals, such as fox and bobcat, that would prey on the white-footed mouse. Tick-borne diseases are such a public health problem that they “should inform the way in which the landscape is developed, so that we can preserve as large and undisturbed, unfragmented a patch of forest…as we can,” he says. For areas already suburbanized, Ostfeld says, "we can pinpoint the riskiest areas, the places with the highest abundance of ticks, and target them for environmentally safe and effective means of controlling the tick population." “Unfortunately, we’re not going to airdrop thousands of opossums, or bobcats, for that matter, into these areas, and hope they stick around," said Ostfeld. DEET seems to be the most effective and durable personal repellent, but if you don’t want to use DEET, check the label for other active ingredients, including IR3535, Picaridin, and undecanone repellents. Permethrin is a synthetic repellent that “clings tenaciously to cotton and repels ticks,” Eaton says. It is sprayed directly on clothing and lasts through several washes. There are natural options, but Eaton says they are not as effective. Prevention of tick bites is still the best weapon in our arsenal against tick-borne diseases. To hear the full conversation, click on this link. The Exchange webpage also features links to resources from UNH Extension, Alan Eaton, and the NH Department of Health and Human Services.